Organisers expect between 50 and 100 people to attend the “Stop Cañete” demonstration on Place Luxembourg, close to the European Parliament building in Brussels, at 2.30pm on Wednesday, 1 October. 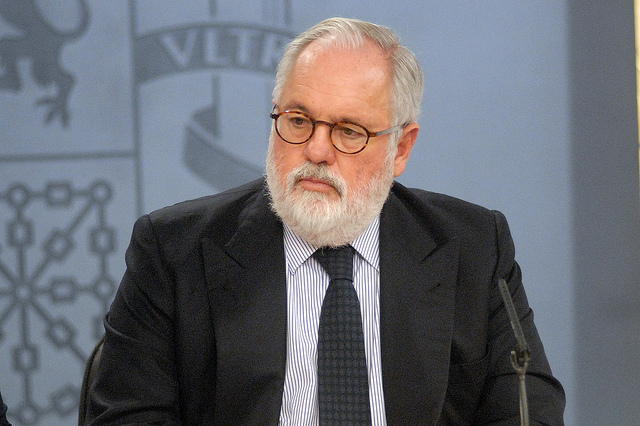 MEPs from Spanish left wing parties including Podemos, Izquierda Unida, Primavera Europea/EQUO, ICV, ERC and AGE, will line up to condemn Cañete, who is criticised for his links to the oil industry and a recent sexist outburst. The Spanish conservative will be grilled by MEPs at about 6PM the same day. Parliament only has the power to approve or reject the new Commission as a whole. But, if the hearing goes badly, they can also put pressure on Juncker to replace an individual commissioner-candidate. Italian centre-right candidate Rocco Buttiglione had to withdraw in 2004, after socialist, liberal and green groups threatened to reject his candidacy over reports that he said that homosexuality is a sin. Environmental civil society organisations and the anti-lobby NGO, Corporate Europe Observatory, will also attend the protest close to the Parliament. It is rumoured there may be additional “actions”, as well as the demonstration, to highlight the opposition to his appointment. No other prospective commissioner is thought to be facing similar protests over the next week of hearings. Martin Behar, of Podemos Belgica, said, “Nobody who has washed his hands in oil should be nominated as energy commissioner. We can expect nothing good for renewables nor for citizens under Cañete’s mandate. Cañete was also accused of “unacceptable sexism” in a letter questioning his independence and freedom from conflicts of interest, sent by the Greens to Juncker. Earlier this year, Cañete was reported as saying that “holding a debate with a woman is complicated, because showing intellectual superiority could be seen as sexist”. A debate between a man and a woman is “very complicated”, because if the man makes proof of “intellectual superiority or whatever”, he would give a “sexist impression” in front of a “defenceless woman”, he said. Podemos is a left-wing party founded in 2014. It scored an impressive 8% of the Spanish vote in May’s European elections. On a dedicated Stop Cañete website, it cited Spanish press reports about the centre-right politician’s alleged tax evasion. It said that, when he was an MEP in 1996, Cañete fought for Common Agricultural Policy subsidies. His wife, who breeds bulls for bullfighting, benefited from those subsidies. She was later investigated for profiting through possible access to privileged information from Cañete’s time as agriculture minister. Responding to written question before his hearing, Cañete promised to strictly obey the code of conduct for commissioners. He said, “I have proceeded to declare all my assets and financial interests and those of my wife as well as her professional activities. Appears to portray everything that is wrong with Spain. MEPs might also care to consider the real possibility that if appointed he may have to resign due to “investigations” into past business activities. This guy seems to have raised to an art form the intertwining of politics and business – it is clear that each feeds off the other. If the Spanish gov did not know that he would raise problems in Bx, this raises questions about the current gov’s “sensitivity”. If they did know he would cause problems – this raises another set of questions. Of course the third possibility is getting rid of old rubbish to the Bx bin. As a commissioner he plays his own interests instead for citizens ! He is abusing of its power ! Canete should be thrown out of the commission ! Ok so this guy has links to the hydrocarbon industries and is once again a consumate politician with I have no doubt Europhilic tendencies hence his appointment. However as a Commissioner charged with Climate Action and Energy shouldn’t we have someone who has real world Climate Science or Engineering expertise? Watching him on TV just now his most significant response was that the Carbon trading Market needs fixing. This week we have learnt from the WWF report, perhaps ironically entitled ‘Living Planet’ states that in the last 40 years the planet has lost over 50% of its animals. Meanwhile the Commission pursues dangerously conflicting goals open borders, free movement and a limited focus on Carbon Trading Markets and gas pipelines. Nothing on An analysis of how power is to be generated investments in R&D and Engineering just Windmills. It is somewhat amusing that the Spanish Politician with this brief is reminiscent of childrens illustrations of one Don Quixote in his appearance.